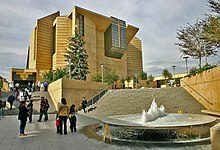 The Archdiocese of Los Angeles ( Latin: Archidioecesis Angelorum in California, Spanish: Arquidiócesis de Los Ángeles) is an archdiocese of the Roman Catholic Church in the U.S. state of California. Based in Los Angeles, the archdiocese comprises the California counties of Los Angeles, Santa Barbara and Ventura. The cathedral is the Cathedral of Our Lady of the Angels in Los Angeles, and its present archbishop is José Horacio Gómez. With approximately five million professing members, the Archdiocese of Los Angeles is numerically the single largest diocese in the United States. The Archbishop of Los Angeles also serves as metropolitan bishop of the suffragan dioceses within the Ecclesiastical Province of Los Angeles, which includes the Dioceses of Fresno, Monterey, Orange, San Bernardino, and San Diego. Following the establishment of the Spanish missions in California, the diocese of the Two Californias was established on 1840, when Los Angeles region was still part of Mexico. 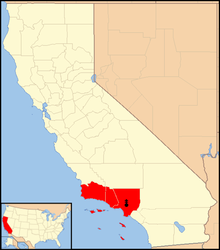 In 1848, the Mexican California was ceded to the United States, and the U.S. portion of the diocese was renamed the Diocese of Monterey. The diocese was renamed the Diocese of Monterey-Los Angeles in 1859, and the episcopal see was moved to Los Angeles upon the completion of the Cathedral of Saint Vibiana in 1876. Los Angeles split from Monterey to become the Diocese of Los Angeles-San Diego in 1922. The diocese was split again in 1936 to create the Diocese of San Diego, and the Los Angeles see was elevated to an archdiocese. The archdiocese's present territory was established in 1976, when Orange County was split off to establish the Diocese of Orange. Christianity in southern California dates back to the Spanish establishment of missions in what was then known as the Las Californias province of New Spain. From 1769 to 1823, the Franciscan order led by Junípero Serra and later by Fermín de Francisco Lasuén established twenty-one missions between present-day San Diego and Sonoma, six of which were located in the present-day territory of the Archdiocese of Los Angeles. In response to the 1781 establishment of the Pueblo de Los Angeles, in 1784 priests from Mission San Gabriel Arcángel set out for the pueblo and established the Nuestra Señora Reina de los Angeles Asistencia as a sub-mission. The asistencia fell into disrepair after being abandoned several years later, and La Iglesia de Nuestra Señora Reina de los Angeles was built on the site in 1814; the church remained the only Catholic church in Los Angeles for many years. Las Californias was split into two provinces in 1804, and the area comprising present-day California became part of Alta California. In 1840, the diocese of the Two Californias was erected to recognize the growth of the provinces of Alta California and Baja California. The diocese was a suffragan diocese of the Archdiocese of Mexico with its episcopal see located in Monterey, and included all Mexican territory west of the Colorado River and the Gulf of California (the modern U.S. states of California and Nevada, and parts of Utah, Arizona, and Colorado, and the Mexican states of Baja California and Baja California Sur). In 1848, Alta California was ceded to the United States after the Mexican–American War, and the Mexican government objected to an American bishop having jurisdiction over parishes in Mexican Baja California. The diocese was split into American and Mexican sections, and the American section was renamed the Diocese of Monterey. Another large split occurred in 1853, when much of present-day northern California, as well as present-day Nevada and Utah, formed the Archdiocese of San Francisco; Monterey became a suffragan of the new archdiocese. In 1859 the diocese became known as the Diocese of Monterey-Los Angeles to recognize the growth of the city of Los Angeles; the see was transferred to Los Angeles and the new Cathedral of Saint Vibiana in 1876. On June 1, 1922, the diocese split again, this time into the Dioceses of Monterey-Fresno and Los Angeles-San Diego; Bishop John Joseph Cantwell, who had previously been Bishop of Monterey-Los Angeles, became bishop of the Los Angeles-San Diego diocese, which comprised the counties of Imperial, Los Angeles, Orange, Riverside, San Bernardino, San Diego, Santa Barbara, and Ventura. On July 11, 1936 the diocese was elevated to become the Archdiocese of Los Angeles with John Joseph Cantwell as its first archbishop; concurrently, Imperial, Riverside, San Bernardino, and San Diego Counties were split to form the suffragan Diocese of San Diego, and the Diocese of Monterey-Fresno was transferred to become a suffragan of the new archdiocese. On March 24, 1976, Orange County was split to form the Diocese of Orange, establishing the archdiocese's present-day territory consisting of Los Angeles, Santa Barbara, and Ventura Counties. In addition to the dioceses of Monterey, Orange, and San Diego, the archdiocese's present-day suffragan dioceses are Fresno (split from the Diocese of Monterey in 1967) and San Bernardino (split from the Diocese of San Diego in 1978). Our Lady of the Angels, covering downtown and central Los Angeles west to Malibu, south to Los Angeles International Airport. The region has 78 parishes, 11 Catholic high schools, 5 Catholic hospitals, and 5 missions. The Episcopal Vicar is Bishop Edward William Clark. San Pedro, covering Long Beach and southern Los Angeles County. The region has 67 parishes, 9 Catholic high schools, 6 Catholic hospitals and 1 mission. Archbishop Gomez appointed Bishop Marc V. Trudeau as the Episcopal Vicar for this region in 2018. The archdiocese is led by the archbishop, who governs from the mother church, the Cathedral of Our Lady of the Angels. The cathedral was dedicated on September 2, 2002, and replaced the former Cathedral of Saint Vibiana, damaged in the 1994 Northridge earthquake. The Archbishop of Los Angeles is the metropolitan of the Province of Los Angeles of the Roman Catholic Church. Its suffragans are the dioceses of Fresno, Monterey in California, Orange in California, San Bernardino, and San Diego. Metropolitan archbishops historically wielded great administrative powers over the suffragan dioceses. Today, such power is only ceremonial and kept as a tradition. Archbishop Gómez is assisted by the current Auxiliary Bishops: Edward W. Clark, Oscar A. Solis, and Alexander Salazar, Joseph Brennan, David O'Connell, and Robert Barron. In addition, Joseph Martin Sartoris and Gerald Eugene Wilkerson are retired auxiliary bishops still living and residing within the archdiocese. Gordon Bennett, S.J., Bishop Emeritus of Mandeville, Jamaica, also resides within the archdiocese, as the Peter Faber, S.J. Fellow in Pastoral Theology and Ignatian Spirituality at Loyola Marymount University in Los Angeles. Note: Years in parentheses indicate the time of service as a priest of the Archdiocese of Los Angeles (or predecessor diocese), prior to appointment to the episcopacy. There are 5 colleges and over 50 high schools within the Archdiocese of Los Angeles. Many churches have affiliated primary schools as well. The archdiocese's Office of Religious Education produces the Los Angeles Religious Education Congress, the largest annual event of its kind in the United States, with an attendance of approximately 38,000. The archdiocese has entrusted the annual celebration of the Votive Mass in honor of Our Lady of the Angels to the Queen of Angels Foundation, a lay association of the Catholic Church founded by Mark Anchor Albert, dedicated to promoting devotion to the Blessed Virgin Mary. On the second Saturday of each year since 2011, the Cathedral of Our Lady of the Angels has hosted a Votive Mass in honor of Our Lady, Queen of Angels. The Mass follows a Marian procession which originates from the historic Queen of Angels parish, which is part of the Los Angeles Plaza Historic District, and culminates at the cathedral. Since 2011 the Queen of Angels Foundation has sponsored the annual Marian processions, Votive Masses, and fiestas in commemoration of Los Angeles’ birthday and the feast of Our Lady of the Angels. Archbishop Gomez has been the homilist and principal celebrant of the annual Mass since 2012. Future Marian processions and Masses will coincide with the City of Los Angeles’ official birthday celebrations on the last Saturday of August. Exception: If August 15 falls on a Saturday or Monday, there is no obligation to attend Mass. Exception: If November 1 falls on a Saturday or Monday, there is no obligation to attend Mass. Exception: If December 8 falls on a Sunday, the solemnity is transferred to the following Monday and there is no obligation to attend Mass. ^ The Roman Catholic Church. Ordo for the Diocese of Monterey & Los Angeles (1911). ^ "Auxiliary Bishops of Los Angeles". Retrieved 12 September 2015. ^ "LA cardinal offers abuse apology". BBC News. 2007-07-16. Retrieved 2008-03-08. ^ "Pope Names San Antonio Archbishop José Gomez Coadjutor Archbishop Of Los Angeles". United States Conference of Catholic Bishops. 2010-04-06. ^ "POPE APPOINTS COADJUTOR ARCHBISHOP FOR LOS ANGELES". Roman Catholic Archdiocese of Los Angeles. 2010-04-02. Archived from the original on 2010-04-09. 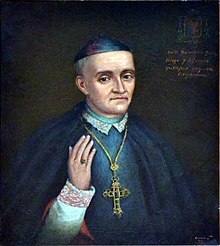 ^ "Archbishop José Horacio Gómez Velasco". Catholic-Hierarchy.org. David M. Cheney. Retrieved 21 January 2015. ^ "Bishop Jose H. Gomez named Archbishop of San Antonio". Opus Dei. 2004-12-29. ^ Allen, Jr., John L. (2010-04-09). "Four points to make about Gomez and L.A." National Catholic Reporter. ^ "USCCB Holy Days of Obligation". Retrieved 2007-05-17. ^ "Archdiocese of Los Angeles Holy Days of Obligation". Archived from the original on 2007-09-28. Retrieved 2007-05-17. ^ "Code of Canon Law". Retrieved 2015-01-02. ^ A concise guide to Catholic Church management. Boone, Larry W. Notre Dame, Ind. : Ave Maria Press. 2010. ISBN 9781594712272. OCLC 464586595. ^ "Pages - ADLA Administrative Handbook Home". handbook.la-archdiocese.org. Retrieved 2017-11-26. Wikimedia Commons has media related to Roman Catholic Archdiocese of Los Angeles. Herbermann, Charles, ed. (1913). "Monterey and Los Angeles" . Catholic Encyclopedia. New York: Robert Appleton Company.